“Roadhouse” is defined as “an inn or tavern usually outside city limits providing liquor and usually meals, dancing, and often gambling.” F.B. & Co. qualifies on all counts. It sits about eight miles downriver in the unincorporated village of Waubeek, population somewhere between 75 and 85 depending on who’s home. It is to be found on some maps and not others. It is only in retrospect that I have come to appreciate the extraordinary experience of the place. From 1868 to 1960 the building housed a general store and boarding house under the same name. I long assumed that it had been constructed with the famous Stone City limestone, Grant Wood’s Stone City being nearby, but I learned that in fact it was constructed of limestone quarried on the spot. 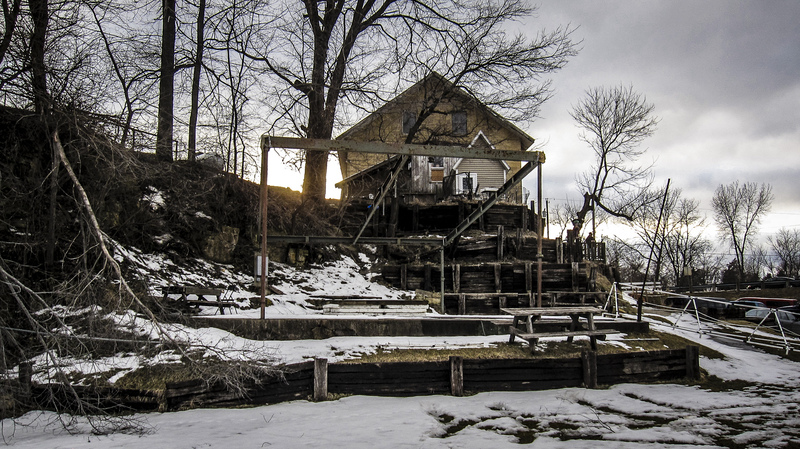 That old quarry now forms a natural amphitheater behind the building along the Wapsipinicon River today. The building sat vacant for a time. In 1979 after purchasing the building, my friend Tim Kula had finished renovating it and opened his bar there. Tim Kula in his prime would promote anything that might make a buck, and there have been times when he has promoted something for the sheer fun of it. There was the era of the Par 3 Golf Course on the premises, remnants of which can still be seen if one knows what one is looking for. He constructed a softball field complete with lights hoping to sell beer to the paunchy guys with a weakness for that game. There were the outdoor boxing matches at night, truly a surreal experience. Fireworks and more fireworks. And there was always music. It is the era of Billy Null in the early nineties that keeps coming to mind nowadays though. Billy was born in the same year as I, although I was not acquainted with him in his youth. He attended high school in a town to the south. He then attended a small, private college nearby but ultimately transferred to Los Angeles City College to pursue his musical career. He was a raging electric blues guitarist in the Texas style and not a bad fiddle player either. He did some session work in Los Angeles and played with bands in both L. A. and San Francisco. He also adopted a lifestyle in the express lane. He lived fast out there. Billy formed his own band. They went on a European tour and then closed out with a series of gigs in Morocco. What an unimaginable mess that sojourn in Morocco must have been! Suddenly, Billy quit and came back here. Nobody ever got a straight answer as to why. He was just back, claiming that he missed the wildlife and the timber along the river. He got a job tending bar at F.B. & Co. Suffice it to say that if you were in the mood for some conversation with your bartender, you were in for some fascinating conversation with Billy. He formed a band here called the Killin’ Floor Blues Band, which became the “house band” in the joint. And Billy began making some telephone calls. Tim had himself previously booked Asleep at the Wheel and John Sebastian. They played their gigs outdoors in the summer. But soon Billy was booking high end blues bands and musicians, one after another. Johnny Copeland. The Legendary Blues Band fronted by two of Muddy Waters’ former side men. Little Charlie and the Night Cats. The Lonnie Brooks Blues Band. Joanna Connor, the great Chicago blues slide guitarist whose act I later caught again at Buddy Guy’s place in Chicago. Lonnie Mack. John Hammond made three appearances soon after he won a Grammy Award. Billy’s band opened for them all inside in a venue that seated a max of 100 with a $15.00 cover. You could reach out and touch these people while they played. It was incredible. Tim put up the musicians during their stay on the second floor in the old boarding house that featured a pool table in the lounge area. Local ne’er-do-wells saw to their needs. Lonnie Mack, for example, swore that he was never coming back unless Trapper Jack agreed to take him fishing again. It was at this time that Tim began to be braced by other bar owners when he encountered them on how he was getting so much free publicity from that regional newspaper. To that point Tim had naïvely assumed that the paper was writing up his place because it was interesting and newsworthy. He became curious. Upon investigation he learned that Billy Null was sleeping with the arts and entertainment editor on an on-call basis. We still laugh about that occasionally. That entire era lasted only for a year or two. Then it was all over as quickly as it had started. I can remember a half dozen haunts in Houston and Austin that are no longer there. Times ain't what they used to be. Ain't it the truth, JMac? It's not just the places either. It is the people. I have passed the tipping point and now know far more dead people than I know live ones. Anyway, this place is still in operation, although much more calmly so. Here is a photo taken from the stage of Susan in the foreground holding court on a slow night. Brass, you might want to edit that jpg and save it under lower resolution. Takin' nearly a minute to load. There are plenty of bars that book bands, but they don't tend to be as old and colorful as that. As to the money, a lot of acts must not be all that expensive because I've seen some good people in some pretty small venues. I don't think it's there any more - probably hasn't been in decades - but there used to be a place called the Showboat in Silver Spring, MD. Not all that big a place, tables rather than theater seating which is obviously less concentrated, but I saw Milt Jackson there and another time saw Dizzy Gillespie. An awful lot of jazz I've seen over the years has been in venues that just aren't very big. I agree entirely, kosher. As far as jazz joints are concerned, the famous Green Mill in Chicago comes to mind. A tiny place, and yet everyone wants to play there. An advantage of an urban area. The thing that I did not convey adequately is how far out in the middle of nowhere this place is. This place is in the bush for sure. Sorry, JMac. I know what the situation is. It will load faster tomorrow, and it is not all that important anyway. We've got a couple dive bars here, one that was featured on that cable show about dive bars. None are like yours though. Yours looks like a jewel of a place and reminds me of a bar on Nantucket, when I lived there in the early 70's, when hippies could still afford to do that. It was called The Chicken Box, a shack, really. A number of bands who played there went on to semi-famousness. 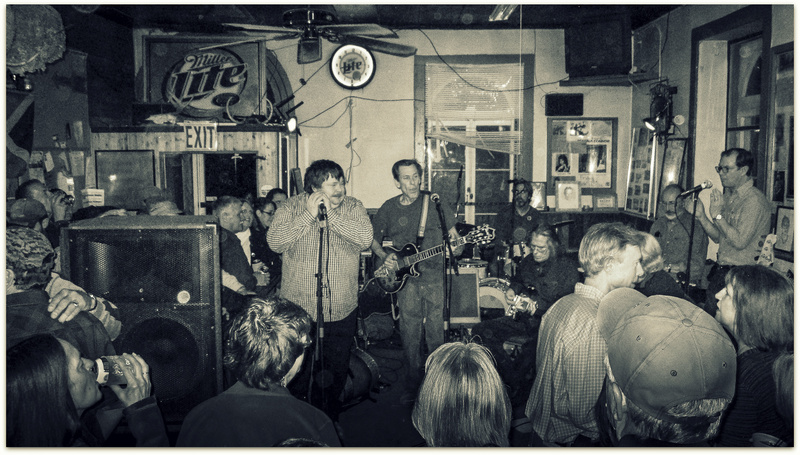 NRBQ. John Lincoln Wright. Muddy Waters played there a couple times. 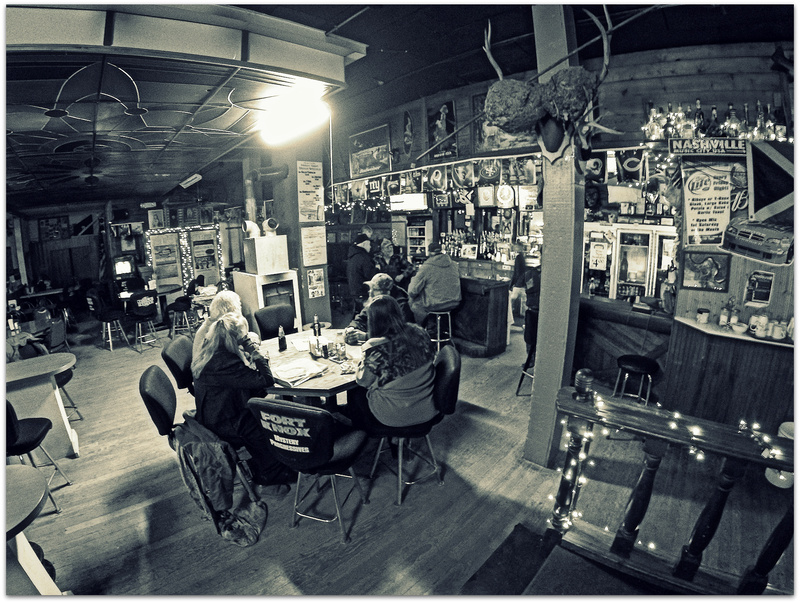 Willie, the original owner passed away and the new owner made it into a trendy nightspot. No one who went when it was Willie's went after it changed hands. It looked a lot like your place. Lots of memories there. ^^^ Ain't it the truth? Maryland border. You in VA, PA, or WV? My Mom lives a little East of 81 and 66. "This is about the smallest place I've played in a long time," Mack said while rolling a cigarette before his show. Of his 200 gigs a year, only one other club Mack plays is as small as F.B. & Co. It's at a Long Island bar that charges $25.00 a head, substantially more than the $15.00 advance admission in Waubeek. The thing I was attempting to say here, and failed to adequately, is that Waubeek is one helluva long way from the likes of Long Island. It is located in a flyover section of a flyover state.